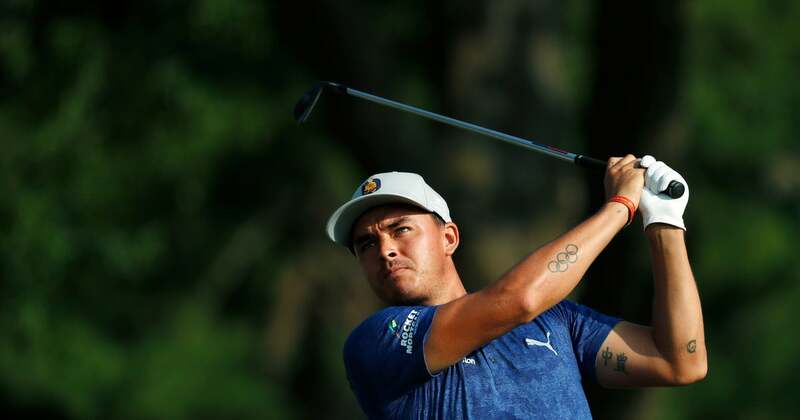 NEWTOWN SQUARE, Pa. (AP) — Rickie Fowler has stayed at home for the last three weeks and two FedEx Cup playoff events because of a partial tear to his right oblique, which he says might turn out to be the best for him. Players at his level face one of the busiest stretches of the year with four FedEx Cup events in five weeks, followed by the Ryder Cup. The first order of business is making sure he doesn’t play one week and then be forced into a two-week break ahead of the Ryder Cup on Sept. 28-30 in France. By missing the two FedEx Cup events, Fowler dropped from No. 17 to No. 26. Only the top 30 after this week go to the Tour Championship. Fowler says the injury to his side occurred over time, though he still remembers when he knew it was an issue. He started the final round of the PGA Championship just three shots behind, but closed with a 71 and was never a factor. Fowler said he spent the last three weeks at home in Florida using ice, heat, pain medication and a laser machine. He has a friend who is a spinal neurosurgeon, and Fowler says he used a laser machine two or three times a day. He thought about returning last week at the TPC Boston, where he won in 2015, but he didn’t start playing until two days before the Dell Technologies Championship and didn’t think he had prepared properly. There also was that text from Ryder Cup captain Jim Furyk, who said he was passing along a message from former captain Davis Love III. Fowler is among 21 players who played Aronimink when it hosted the AT&T National in 2010 and 2011 (as Congressional was preparing for the U.S. Open). Fowler played in the final group in 2011 but shot 74 and tied for 13th. Justin Thomas knows how valuable the Tour Championship can be for a PGA Tour rookie, and not just because of the shot at the $10 million bonus. He missed out by one shot getting to East Lake as a rookie in 2015, and it ultimate cost him, especially when Daniel Berger advanced. The rookie race this year has two tournaments left, and East Lake could go a long way in persuading players which way to vote. Four players classified as PGA Tour rookies have reached the third playoff event at the BMW Championship, and Aaron Wise would seem to be the front-runner. He won the AT&T Byron Nelson and tied for second the week before at the Wells Fargo Championship. Wise is at No. 18 at the BMW, virtually a lock to make it to East Lake. Austin Cook won at Sea Island at the end of last year and is No. 42 going into the BMW Championship. Another rookie winner was Satoshi Kodaira of Japan, who won at Hilton Head. He was eliminated from the FedEx Cup last week, and PGA Tour members have a history of not voting for international players. In 2010, Rickie Fowler won the award over Rory McIlroy, even though McIlroy won a tournament that year. Two other rookies made it to Aronimink — Peter Uihlein and Keith Mitchell — just narrowly. Without having won this year, they would have to reach the Tour Championship and contend at East Lake to have any chance. Cristie Kerr and her husband, Erik Stevens, are parents again. Five years after their first child, Mason, was born to a surrogate after in vitro fertilization, they announced on Instagram on Monday they have had their second son, whom they named Griffin. “A different kind of Labor Day!” she said. The baby was born Aug. 28. Kerr is playing next week in the Evian Championship in France, the fifth and final LPGA major of the year. Bryson DeChambeau left out the details when asked for memories of his first science project when he was younger. “Funny enough, I was actually trying to come up with a theory that — should I even say this? — that gravity actually pushed outward and not inward,” DeChambeau said after his second straight FedEx Cup playoff victory. “But it was pretty much gravity that was just pushing in the opposite direction,” he said. But isn’t gravity what allows a golf ball to fall into the cup? Of the 21 players at the BMW Championship who played the AT&T National at Aronimink in 2010 and 2011, three were amateurs. Byeong Hun An missed the cut in 2010. The following year, Patrick Cantlay tied for 20th and Peter Uihlein, the reigning U.S. Amateur champion, tied for 70th. … Four years after hosting the Ryder Cup, Le Golf Nacional outside Paris will host the 2022 World Amateur Team Championships. It will be the third time the World Amateur Team is held in France. … The European Tour says Made in Denmark, the tournament Matt Wallace won last week, will move next year to May 23-26. That’s one week after the PGA Championship at Bethpage Black on Long Island. American players are leading the money lists on the Mackenzie Tour in Canada (Tyler McCumber), the PGA Tour Latinoamerica (Tyson Alexander) and the PGA Tour China (Charlie Saxon). “If you play well, you win. There’s no science or math or anything that can go in there. You play good, you win. It’s pretty damn simple, if you ask me.” — Dustin Johnson, on what makes a good match-play competitor.